Quizno's is now serving a Prime Rib Sandwich on their trademark toasted bun. It's said to be "thinly-sliced prime rib with melted mozzarella cheese, sauteed onions and mild peppercorn sauce." Quizno's sandwich is shown on the left with the "double portion of meat" option. I've not had Quizno's prime rib sandwich, but I did have a prime sandwich not long ago at Mustache Pete's in Cambria, CA. (Both the restaurant and the town are definitely worth a visit by the way.) And I can tell you that there is no way that Quizno's comes close to Mustache Pete's (pictured at right). What an incredible sandwich... and none of this "thinly-sliced" pieces stuff; Pete's is a slab-thick slice of heaven! I had one of Quizno's so-called "prime rib" subs today. More like chipped beef than prime rib. Quiznos is really nasty, thier onions and bread are not good at all, always makes me ill. I cannot imagine what thier idea of "prime rib" would taste like. I love Fast Food News and read it daily. 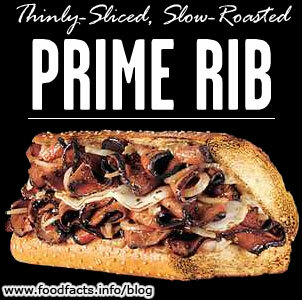 This Quiznos Prime Rib promotion was sponsored by the federal government's Beef Board. I just posted about a letter from USDA to the Beef Board approving the ad campaign. They wouldn't tell me the nutrition facts. Anybody know how many calories in this bad boy? Tried looking at Quiznos's web site and couldn't find any health info. I had a Quiznos Prime Rib last night for the first (and Last) time... It was tasty, but it was no prime rib... I had no less than three bite sized pieces of Gristle in my sub. I've bought better quality beef for $1.50 / lbs in the Bargin Bin at FarmerJacks for using in Sausage. I was shocked not to find nutritional informaion online, but after reading about other peoples experiences, and the Corporate culture, it seems like this company may be being run by individuals with the same sense of honsety and honnor as our politicians who routine brag about family values, but really practice anything but. Breaks down like this: I don't eat fast food or anythign of that nature vey often. But as a dude, every now adn again I love to get my hands on a giant burger or in this case a giant Quizno's Prime Rib Sub. I can't say taht I do't know exactly what Prime Rib is supposed to taste like, but whatever they gave me was great. I don't care if it was yesterdays leftovers from the trash can, the sub was great. Tender, hot, juicy, just enough sauce. Its like Chiense food: I dont care of its dog, cat, or person, it tastes good with General Chicken sauce. Same goes for Quizno's Prime Rib Sub...without the Genral Chicken Sauce. This is a great sandwich. 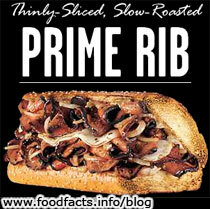 The sauce is excellant and the Prime Rib is nice and thinly sliced. Expensive, since a regular sized sub, combo meal with chips and a small soda is about $10. Probably about 1200 calories but a nice treat from time to time. I found the calorie count on Quizno's website. 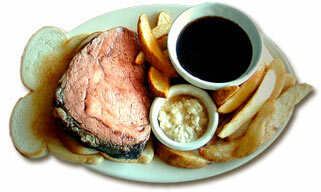 A small prime rib peppercorn with cheese and dressing is 590 calories, a regular with cheese and dressing is 980.